Powers/Abilities: Amergin had a variety of magical abilities, primarily the casting of various spells, including dimensional and temporal transport. He briefly wielded the Evil Eye, able to absorb and project power on a great level. Amergin may well have had a lifespan extending over two thousand years and augmented by magical. His abilities were likely much greater in his prime. History: (Celtic/Gaelic Myth) Amergin is a son of Milesius, a Gaelic leader who left Spain to conquer Ancient Ireland. Losing his wife en route, Milesius landed on Eire on the day of The Feast of Beltane (May 1) and refused to accept worship rites from the Celtic Gods who demanded worship rites from the previous inhabitants (a event passed down in myth as the defeat of the Tuatha da Danaan). Milesius and his sons conquered Eire and met the goddesses Banbha, Fodhla and Eriu whose husbands controlled the island until that time. They promised each goddess the honor of having the island named after her. Eriu then promised Amergin that his father and brothers would live to conquer the land if they named it Eire after herself. Mac Cuill, Mac Cecht and Mac Greine, the husbands of the three goddesses who had ruled up till then, called upon their ancestors, the Celtic Gods, to prevent Milesius and his sons from further conquering the land, but the Sons of Milesius then called upon their own Gaelic Gods (a separate group of gods within the Tuatha da Danaan) to allow them to conquer the area. Although the Celtic gods were defeated by the followers of their own kin, they sent curses upon the Sons of Milesius that deprived them of milk and grain. Amergin and his brothers eventually reached a compromise with them both allowing them to co-habit the area with the Celts, their worshippers. The Sons of Milesius decreed they would rule the land equally. Amergin was the one to decide that his brother Eremon would rule first until he died and would be followed by Eber Finn (their other brothers reportedly having died sometime earlier). Eber Finn refused and the two brothers went to war against each other, controlling opposite sides of the country as Amergin tried to negotiate peace between the two sides. Eber Finn was killed in the struggle and Eremon united the two halves of Eire as its first undisputed ruler. 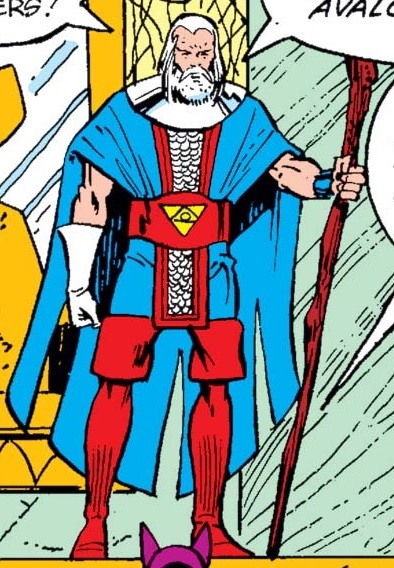 (Avengers I#225 [BTS, FB]) Under unresolved circumstances, Amergin was accepted into Otherworld, the cosmology of the Celtic and Gaelic Gods that includes Avalon. He served as an ally of the Tuatha de Danaan as an ally against the Fomore. (Avengers I#225 (fb)) - Amergin led his people to the isle of Avalon, where spring reigned eternal. Via song and magic his people drove off the Fomor. Eventually Amergin's power faded, and the Fomor began to strive against Avalon again, seeking to strike against an unsuspecting Earth. (Avengers I#225 (fb) - BTS) - Around the 12th Century AD, Amergin's people fell, and Avalon came to mirror the appearance of the Dark Realm of the Fomor. Amergin sought out the aid of the Black Knight (at the time the body of Eobar Garrington possessed by the spirit of Dane Whitman), and through him learned of his future allies, the Avengers. Amergin contacted his own descendent, Dr. Druid, and arranged for him to serve as a conduit to send the Avengers to Avalon in his time. Amergin intended to use the legendary Evil Eye to drive off the Fomor forever, but he required the aid of the Avengers to siphon the power it needed from the monstrous Balor. (Avengers I#225) - Druid succeeded and the Avengers (Captain America, Hawkeye, She-Hulk, Thor, Wasp) arrived before him. With the help of the Black Knight, he convinced them to join with him, but they were suddenly ambushed by the Fomor. 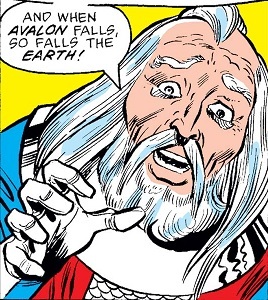 As the Avengers fought the Fomor, Bres slipped past Amergin, overwhelmed him, and used his connection to Dr. Druid to travel forward in time to the modern era. (Avengers I#226) - Somewhat recovered, Amergin tried to stop the Black Knight from joining the Avengers against Balor, to no avail. The Fomor convinced Balor to join them in a later assault on Avalon, where Amergin stood at the gates, backed by the Avengers and the Black Knight. Balor blasted Amergin, but the Evil Eye protected him, and he used the Eye to drain Balor's power. Before he could complete the process, Amergin was struck down from behind by Elathan, who proceeded to drain his life force. The Black Knight disrupted Elathan's leeching bolts, but Balor then grabbed the Eye and touched it to his own eye in hopes of regaining his power. The backlash leveled Avalon and mortally wounded Amergin, but the Eye had now accumulated its power store in absorbing the entirety of Balor. Amergin instructed the Black Knight to use the Eye to close the portal to Earth and drive off the Fomor, but also told him that the process would kill him. Amergin wished him luck and then passed on. The Black Knight successfully used the Eye to drive off the Fomor, and while Garrington's body was destroyed, Amergin's last spell sent Dane Whitman's spirit back to the modern era, where it reformed his original body. Amergin's spell also sent the winged horse Valinor with him. The closure of the gate also sent the Avengers back to the modern era. Comments: Adapted by Steven Grant, Greg LaRocque and Chic Stone. It is significant to mention here that it is unknown as to whether the Amergin of the Marvel Universe is meant to be the Amergin from Celtic-Gaelic Myth. They could actually be meant to be two separate figures--Will. Given his involvement in Avalon, the home of the Celtic Gods, a connection certainly seems likely. The Druids of Avalon were encountered by Prester John, who was present as they all fell before a plague. I would have to guess that the plague was brought on by the Fomor, and while the rest of the druids fell, Amergin survived, but remained hidden. My guess is thus that Prester John's meeting with the druids preceded this story, but that's just a guess. Also, the Druids of Avalon created the Evil Eye. It is not known what Amergin's role was in that event. Celtic/Gaelic Mythology is full of stories with a very thick prose and imagery that does not translate well into stories as easy to read and understand as that of the Greek Myths. The history given here is as best as it can be discerned given the nature of the stories that are given--Will. Noah’s flood is traditionally dated by the generations set in the Bible to have occurred around 2400 BC (with Adam and Eve existing in 4004 BC), which would place Milesius landing in Eire around 1900 BC. This, however, would place a strain on the hero CuChulainn existing in the 5th Century BC as according to the list of Kings of Ireland (of whom Eremon was the first). Traditional dating would place the Biblical flood around 1625 BC (which would then conflict with the legend of Gilgamesh) and set Milesius landing in Eire around 1130 BC, a very appropriate time since that would be the time Brutus, son of Aeneas, would land in Eire, but is still a bit of a strain on CuChulainn possibly existing in the Fifth Century BC. However, some texts place CuChulainn living in the First Millennium BC. To atone for all these varying dates as well the legends of Noah and Gilgamesh, at least historically, it would be best to place Noah’s flood in 2400 BC, historical Gilgamesh in 2395, the Milesians in Eire about 1900 BC and perhaps CuChulainn in the first Millennium AD--Will.